Hi Dave! Have I got a story for you! My Wife Lori and I took a drive to Cascade Boat Club to look at the Mississippi River. It had been very cold, and the river had been full of ice, bank to bank. But after several days of unseasonably warm weather, the ice started to move out. Not wanting to give up our boating season the last day of "04" when we saw there was very little ice left along the shore I drove Lori's Ford Explorer down to the waters edge and gently nudged against the ice. To our delight it slowly moved away from the bank and into the slow current that runs along the West bank. Up the hill we went to return as quickly as possible with Big Red and Izona in tow! This would be the first time we launched Izona at the Boat Club, but with no delay we hit the water at 01:15 PM with 49.9 hours on the meter. 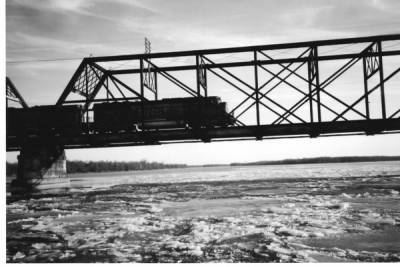 Leaving Cascade and traveling north we encountered a very large ice flow above and around the BNRR bridge. Izona walked right thru the ice with no apparent problems. A railroad engineer passing overhead at that time waved hello in bewilderment, I'm sure. 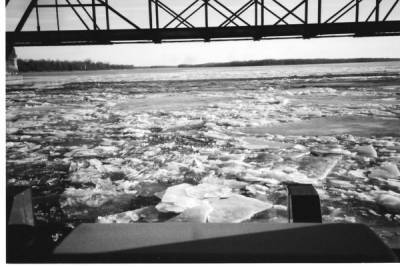 We traveled up river a few miles at low speed, which is where we like to cruise anyway, and took a few pictures of the eagles sitting on the ice, and a few photos of the local harbor tows iced in along the bank. We returned to our landing at about 04:00 PM with 52.6 hours on the meter not wanting to load in the dark. Izona is a bit of a challenge to load anyway. Our holiday weekend is not over! 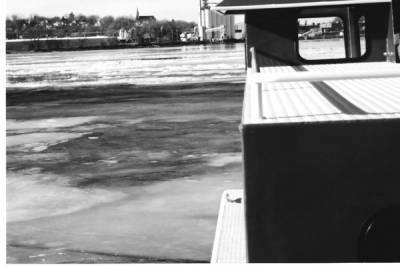 After several comments of "It must be nice" and "Bet you wouldn't be out there without your heaters" we decided to take another ride in the ice filled river, only this time we were taking the Minnow II. 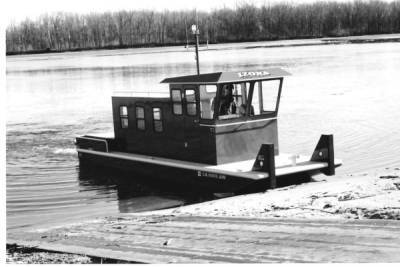 A 16' fiberglass fishing boat with a 9.9 HP Mariner outboard. Back down the hill to Cascade we went with all the Carhart Clothing we owned. Once again we recaptured the ever so coveted title, "Last out, last year. First out this year." Sorry Gill, last years title holder! 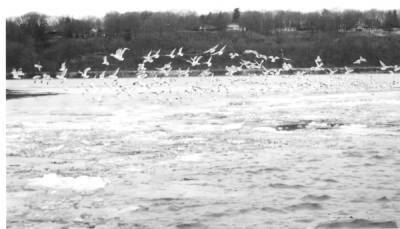 We traveled up river to Burlington and took a few pictures of the gulls and eagles and when it started to rain and sleet we knew just how crazy we must look to the people up town who stared in amazement as we went by. Slowly again we returned to the Boat Club, trailed the Minnow II and went in for a soda and a few degrees of their heat! Izona trip log, trip #10, with 52.6 hours on the meter we set Izona in the river at 09:30 AM at the Burlington, IA. boat ramp. It was 38 deg. cloudy and northwest wind that cut like a knife, but it was to be warm and dry in the wheelhouse when the Merc fired and sent the warm water to the heater! Yes, it must be, and it is nice we thought. We never know quite where we are going when we set out, but soon after Lori was aboard we were downbound at no wake speed. We cruised gently under the BNRR bridge and soon were riding along Big Island, were we saw two of our close friends, Gil and Jeff Douglas, who had on all the coats they owned! I of course in my trade mark red T-shirt. Again with it must be nice. I love it! We talked a little while and then turned and headed up river and around the point of the Island turned and again southbound past Cascade and down to the ISU Power plant where we tried, and could not count all the eagles! Truly an amazing sight. We could not speak, to travel within 30 to 40 feet of such magnificent birds and not disturb them is remarkable. The rest of the day went quite the same, not a soul on the river for miles, and then only a fisherman or hunter. No jet skis or race boats. We traveled all the way to Fort Madison, IA. before we turned the helm upbound for the return trip. We arrived at Burlington at 16:45 PM with 59.3 hours on the meter. We had loaded our old camera with black and white film the last trip and used up the roll this trip. I hope you enjoy the pictures. Sometimes you don't need all the color, the pictures tell you the story. Got to go to work tomorrow, bad weather coming, but I'll have a couple of pictures of our holiday weekend taped on the dash of the old semi to get me thru the long week ahead. Keep safe my boat, keep safe my Wife. And help me travel the river of life. Izona at Cascade Boat Club Friday am.